Please note that owing to recently installed traffic-calming measures, we will be using a slightly different start/finish point. All are welcome at our club time trials: make sure you turn up in time to sign on. You'll need a mechanically sound bike and a bike helmet. We recommend the use of a rear light, especially in evening events such as this one. You need to be 12 or over to ride time trials. If you are under 18 you will need permission from a parent or guardian to take part (download a permission form in pdf format and in Word format). Each of our courses has a route description and a risk assessment. Make sure you have familiarised yourself with the course! 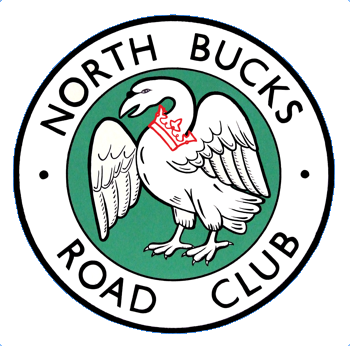 The event starts at 6.45pm, Wednesday 23rd August, and entry is on the line at £3.00 (NBRC members), £5.00 (non-members). Maximum number of riders 40. The meeting point is in the car park by the river, on Calverton Road, near the start by Milford Avenue. This is the last evening event in our time trial series. The next event will be on Saturday 2nd September at 9.00am, and is on the Brogborough course. However, this course may not be available owing to traffic lights - if so, we will once again use the Stony course. Following the cancellation of the Club 10 mile Championship event on 9th August owing to flooding, the Championship will be held on the Stoke Hammond course on 9th September, starting 9am. We had a good turnout of 16 riders tonight. Dry weather and quite warm. Another good ride from Barry to take the win. This evening we used the original start point, since the traffic calming thing gives right of way to traffic heading away from Stony Stratford, but moved the finish line south of the traffic calming. AFAIK, this didn't cause problems and is the same start/finish as used by Team MK on this course. 1 8 Barry Connolly TeamMK 25.19 Sen.
2 7 Chris Manko TeamMK 25.44 Sen.
3 16 Leigh Smith JCA-Equipe Velo 26.10 Sen.
9 10 Nathan Gallavan NBRC 30.03 Sen.